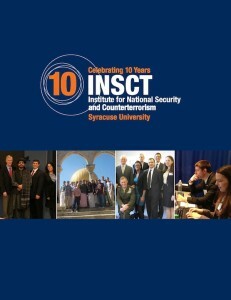 The Institute for National Security and Counterterrorism (INSCT) at Syracuse University was established in 2003 as a collaboration between SU’s College of Law and the Maxwell School of Citizenship and Public Affairs. 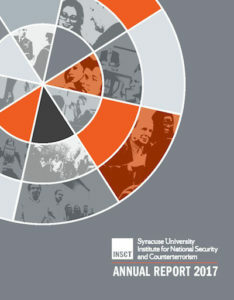 The Institute for National Security and Counterterrorism (INSCT) at Syracuse University is established in 2003 by SU’s College of Law. 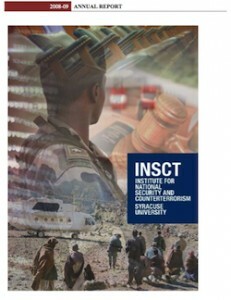 INSCT begins its Curricular Program in National Security and Counterterrorism Law, offering students base courses in national and international security and counterterrorism law and policy, as well as interdisciplinary elective courses. The Maxwell School of Citizenship and Public Affairs, with the support of Dean Mitchel B. Wallerstein, joins the SU College of Law in sponsoring the INSCT. Maxwell School Dean Mitchel B. Wallerstein becomes an INSCT Senior Policy Advisor, a position he continues to hold as President of Baruch College, City University of New York. Gen. Montgomery Meigs (Ret.) 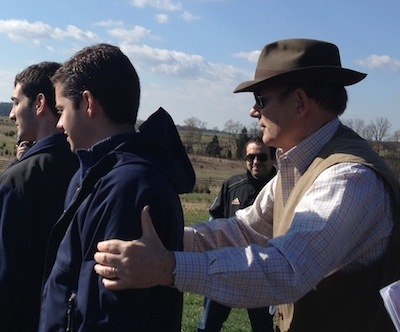 at the 2013 Defense Strategies “Staff Ride” to Gettysburg. The Maxwell School’s Louis A. Bantle Chair in Business and Government Policy and INSCT sponsor the 2005 symposium “The War on Terrorism: Round II,” with keynote speakers Tom Brokaw of NBC News, and Rep. Ellen Tauscher (D-CA) of the House Armed Services and Transportation Committees. INSCT begins to offer its 12-credit Certificate of Advanced Study in Security Studies, designed for graduate students preparing to be professionals in security and counterterrorism. INSCT partners with the Interdisciplinary Center’s Lauder School of Government, Diplomacy, and Strategy and its academic center, the Institute for Counter-Terrorism, in Herzliya, Israel. 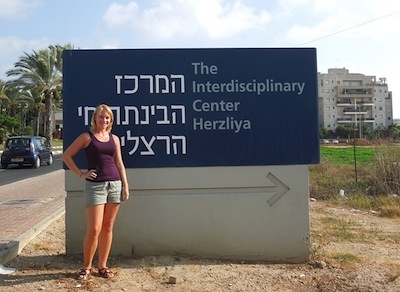 INSCT student Emily Schneider (LAW ’13) outside the IDC in Herzliya, Israel. INSCT co-sponsors the conference “Challenges in the Struggle Against Violent Extremism: Winning the War of Ideas,” with the Maxwell School’s Louis A. Bantle Chair in Business and Government Policy & National Security Studies program. Keynote speakers include Admiral Edmund P. Giambastiani, vice chairman of the US Joint Chiefs of Staff; Raymond DuBois, former Acting US Under Secretary of Defense; and Dr. Matthew Levitt, Deputy Assistant Secretary for Intelligence and Analysis at the US Department of Treasury. Admiral Edmund P. Giambastiani, former vice chairman of the US Joint Chiefs of Staff. For the 100th anniversary of The Hague Convention of 1907— and with significant support from Paul Greenberg (SU ’65)—INSCT sponsors the symposium “New Battlefields/Old Laws,” launching its continuing project to re-examine policies and laws for the conduct of armed conflict in the age of asymmetric warfare. Two key texts are published: Counterterrorism Law and Combating Terrorism, both co-authored by William C. Banks. INSCT Director William C. Banks is named the first College of Law Board of Advisors Distinguished Professor at Syracuse University. From September to November, INSCT hosts the National Security Advice Speaker Series, beginning with the panel discussion “National Security Advice for the Next Administration” and continuing with talks by Bruce Hoffman and Job Henning. The “Old Battlefields, New Laws” project continues with the conference “State Conflicts with Non-State Actors,” part of ICT’s 8th Annual International Counter Terrorism Conference in Herzliya, Israel. 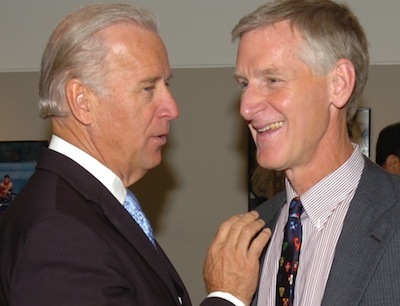 US Vice President Joseph Biden (LAW ’68) and Professor William Banks. 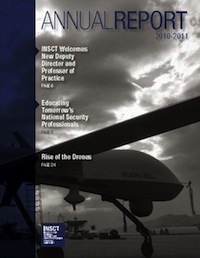 INSCT joins University of the Pacific, McGeorge School of Law as co-sponsor of the nation’s only peer-reviewed journal devoted exclusively to national security law and policy: the Journal of National Security Law & Policy. The journal is now co-produced by INSCT and Georgetown Law. The David F. Everett Postconflict Reconstruction Speaker Series begins, a part of INSCT’s Postconflict Reconstruction program. The first speaker is Dr. Veronique Dudouet, researcher at the Berghof Research Center for Constructive Conflict Management in Berlin, Germany. INSCT hosts the Islam and International Humanitarian Law Workshop, a gathering scholars and practitioners with interest in the contribution of Islam to the rules governing the conduct of warfare and humanitarian law. INSCT formalizes its relationship with the Maxwell School’s Downing Scholars program, an academic partnership with the Combating Terrorism Center at the US Military Academy at West Point, NY. Maj. Christopher DeMure and Maj. Don Canterna are INSCT’s first Downing Scholars. INSCT begins offering its Certificate of Advanced Study in Postconflict Reconstruction, to provide students with a documented concentration and familiarization with the major aspects of this emerging discipline. The United States Institute of Peace (USIP), International Institute of Higher Studies in Criminal Sciences (ISISC), and INSCT begin the Postconflict Justice and Islam project to assess the conformity to the Shari’a of internationally recognized modalities of postconflict justice for international crimes. The Maxwell School announces the creation off the Andrew Berlin Family National Security Research Fund, established in honor of Professor David H. Bennett and operated through INSCT. The fund provides research and related support to Maxwell School faculty and students affiliated with INSCT. In March, James B. Steinberg becomes Dean of the Maxwell School and an INSCT Senior Policy Advisor. Prior to joining SU, Steinberg was US Deputy Secretary of State. 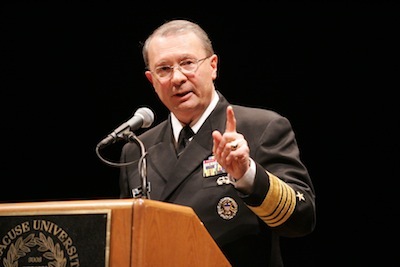 Vice Admiral Robert B. Murrett (Ret. ), former Director of the National Geospatial Intelligence Agency, joins INSCT as Deputy Director. With support from SU alumna Carol Becker (’76), INSCT begins offering Becker Study Abroad Fellowships and the Becker Speaker series, as part of its Security in the Middle East program. 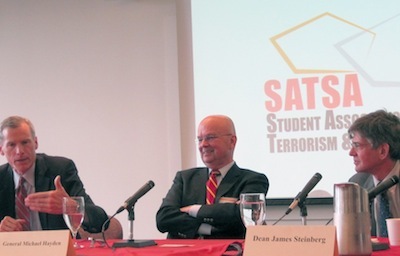 Professor Robert Murret, Gen. Michael Hayden, and Maxwell School Dean James Steinberg at at panel discussion organized by SATSA in 2010. INSCT joins with the American Bar Association to host the 3rd Annual Seminar on Teaching Law and National Security at SU, a conference that brings together the practitioner and academic communities to discuss the teaching of national security law and the training of future practitioners. INSCT hosts US Army Senior Service Fellow Col. Casimir Casey, a practitioner of intelligence gathering and analysis and an assistant professor at the US Military Acedmy at West Point, NY. In February 2013 the Institute for Veterans and Military Families (IVMF) and INSCT released “A National Veterans Strategy: The Economic, Social and Security Imperative,” a report that develops a logical and researched case for the social, economic, and security-based interests served by a whole-of-the-nation National Veterans Strategy. 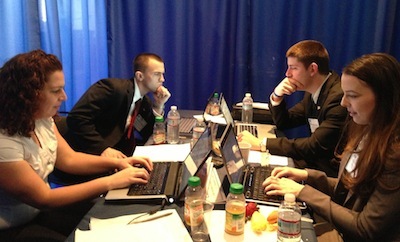 INSCT students at the Georgetown Law National Security Crisis Invitational, March 2013. 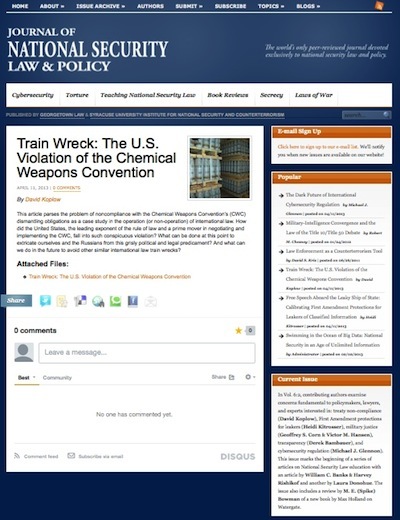 In April 2013, four security studies graduate students from Syracuse University’s College of Law and the Maxwell School of Citizenship and Public Affairs took part in the first National Security Crisis Law Invitational from April 4 to 6, 2013 at Georgetown Law in Washington, DC. In April 2013, INSCT recognized 32 CAS in Security Studies students; 16 CAS in Postconflict Reconstruction (PCR) students; and 19 Curricular Program in National Security and Counterterrorism Law students. This graduation brought the total number of INSCT alumni to 470 over 10 years (185 total law program grads; 232 CAS in Security Studies grads; and 53 total CAS in PCR grads). INSCT students in Herzliya, Israel, July 2013. 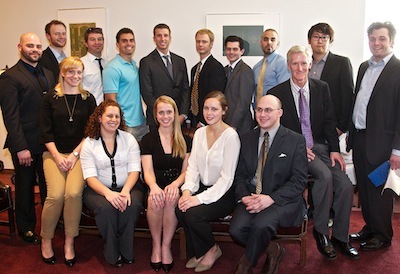 (L to R) Abigail Reese, Callie Moncus, Seth Binder, Dr. Eitan Azani, Zach Shannon, Andrew Pappart, Dan Haverty, Geoff Daniels, Alex Wiemer, and Greg Flatow. 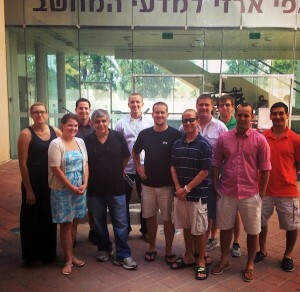 In Summer 2013, 10 INSCT students traveled to Herzliya, Israel as part of the Program on Security in the Middle East. In July 2013, Lt. Col Craig Baumgartner joined INSCT as a 2013-2014 Army War College Fellow. 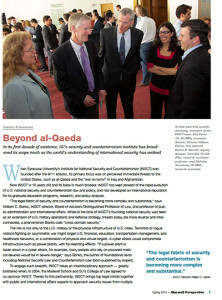 In September 2013, INSCT and the Institute for Counter-Terrorism (ICT) at the Interdisciplinary Center in Herzliya, Israel launched IHLToday.com, part of INSCT/ICT’s acclaimed New Battlefield, Old Laws project. The site is intended to provide a digital format to advance the international legal framework that has evolved for modern warfare. In January 2014, INSCT Faculty Member David M. Crane co-authored the “Caesar Report” documenting alleged war crimes by the Syrian government during the Syrian Civil War. Crane testtifed to the UN Security Council about the report’s findings. In early 2014, INSCT was invited to join the Brookings Institution Saban Center US-Islamic World Forum in Doha, Qatar. In March 2014, INSCT began a partnership with Mitvim, the Israeli Institute for Regional Foreign Policies. INSCT Becker Fellows began studying at Mitvim in summer 2014. In April 2014, new Faculty Member Nathan Sales, an expert in national security and administrative law, was welcomed to the INSCT team. In July 2014, COL Mike Buckley and LTC Patricia Hagen joined INSCT as a 2014-2015 Army War College Fellows. 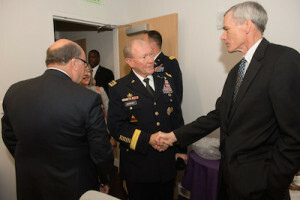 In October 2014, INSCT helped celebrate the 90th anniversary of SU’s Maxwell School of Citizenship and Public Affairs by inviting Gen. Martin E. Dempsey, Chairman of the US Joint Chiefs of Staff, to speak at the SU College of Law about “Public Service in an Age of Complex Global Security Challenges.” The talk was co-sponsored by SU’s Institute for Veterans and Military Families. In December 2014, representatives from INSCT traveled to the Arab Gulf to co-host this preparatory workshop toward a future international conference on Islam and the Laws of War, to be held in Riyadh, Saudi Arabia in 2015. “The Role of Shari’a and Islamic Laws of War in Contemporary Conflict” workshop took place at the King Faisal Center for Research and Islamic Studies (KFCRIS) in Riyadh, Saudi Arabia on Dec. 14 and 15, 2014. The workshop was hosted by Prince Turki bin Faisal Al Saud, Chairman of KFCRIS. Co-hosts of the event, along with INSCT, were two partners in INSCT’s Islam, Law, and War research project: the US Institute of Peace (USIP) and Italy’s International Institute of Higher Studies in Criminal Sciences (ISISC). 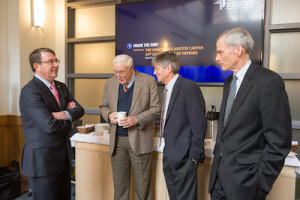 In April 2015, US Secretary of Defense Ashton Carter was a guest of the Institute for Veterans and Military Families, where he met to discuss Syracuse University’s veterans programs with, among other, INSCT Deputy Director Robert B. Murrett. In April 2015, the Curricular Program in National Security and Counterterrorism formally becomes the Certificate of Advanced Study in National Security and Counterterrorism. In June 2015, INSCT hosted Controlling Economic Cyber Espionage, co-sponsored NATO Cooperative Cyber Defence Center of Excellence, a two-day workshop that examined the state of domestic and international approaches for controlling this postmodern form of economic, military, and industrial spying. In June 2015, INSCT Director William C. Banks was named Interim Dean of Syracuse Law, replacing Dean Hannah Arterian. In November 2015, INSCT Director of Research Corri Zoli—whose research examines the perception of military veterans toward post-service education and employment—was invited by Warrior-Scholar Project (WSP) to chair its Academic Board of Directors. WSP helps veterans succeed in higher education with immersive one- to two-week long academic boot camps hosted at universities (including SU) during summer break. Other members of WSP’s academic board are retired Gen. David H. Petraeus and Ambassador Paul Russo. In January 2016, INSCT Director William C. Banks published, along with Professor Stephen Dycus of Vermont Law School, Soldiers on the Home Front: The Domestic Role of the American Military (Harvard UP). 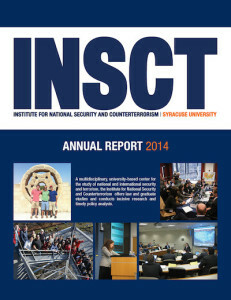 In April 2016, INSCT recognized 54 successful candidates in the National Security and Counterterrorism Law, Security Studies, and Postconflict Reconstruction certificates of advanced study programs. In June 2016, INSCT Deputy Director Robert B. Murrett won the prestigious Birkhead-Burkhead Teaching Award from the SU Maxwell School. In August 2016, Lt. Col. Michael S. McFadden joined INSCT as an Army War College Fellow. In December 2016, the UN General Assembly created the “Syrian Accountability Center,” assisted in this effort by INSCT Faculty Member David M. Crane. In April 2017, INSCT became a sponsor of the ABA Standing Committee on Law and National Security’s Annual Review of the Field conference. 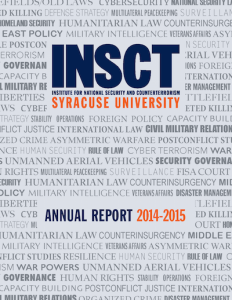 In April 2017, INSCT recognized 33 successful candidates in the National Security and Counterterrorism Law, Security Studies, and Postconflict Reconstruction certificates of advanced study programs. In June 2017, President Donald J. Trump nominated INSCT Faculty Member Nathan A. Sales to the position of Coordinator for Counterterrorism with the Rank and Status of Ambassador-at-Large at the US Department of State’s Bureau of Counterterrorism and Countering Violent Extremism. Sales was confirmed by the US Senate on Aug. 3, 2017. In September 2017, INSCT convened the 10th annual New Battlefields/Old Laws workshop in Herzilya, Israel. A signature INSCT project, NBOL has been at the forefront of inquiry into updating centuries-old laws and norms of armed conflict in the age of asymmetric warfare. 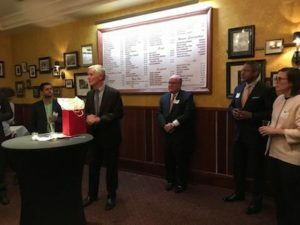 In November 2017, the annual INSCT Alumni Reunion included the honoring of Director William C. Banks for 15 years at the helm of the Institute. In December 2017, INSCT Director William C. Banks was named Senior Fellow at Georgetown Law’s Center on National Security and the Law. In March 2018, David M. Crane announced his retirement from the Syracuse University College of Law, after 12 years as a Professor of Practice. In March 2018, INSCT students once again took part in the National Security Crisis Law Simulation at Georgetown Law. This year, the students competed not only with other national security law students from the US but also students from six Canadian universities, the Australian National University, and the UK. In July 2018, noted jurist, scholar, and law and policy practitioner the Hon. James E. Baker joined the faculty of Syracuse University College of Law, as well as the Maxwell School of Citizenship and Public Affairs, as a Professor in Fall 2018 and took the helm of INSCT from Professor William C. Banks, who founded the Institute in 2003. One of the most noteworthy of INSCT’s accomplishments should probably be counted as three. Our certificates of advanced study in national security and counterterrorism law, security studies, and postconflict reconstruction are some of the most concrete measures of the Institute’s success. This year, we added 33 certificate holders to an alumni base of more than 600. Our alumni show us—by the strength of their community, the growth of their careers, and their continued support—that we are on to something. During my time as Interim Dean, I traveled widely in the United States and internationally. 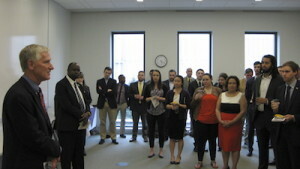 I met with INSCT alumni, potential students, and colleagues at other universities, think tanks, and governments. 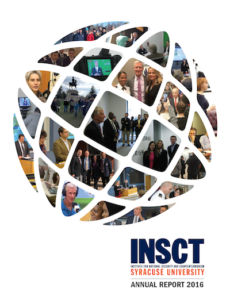 I learned that INSCT’s reputation is strong and getting stronger, based on our broad recognition as a premier institute for the education of future national security practitioners and as go-to experts for legal and policy advice grounded in interdisciplinary research. Interdisciplinarity is the hallmark of INSCT’s approach. Not only do we collaborate with dozens of cross-sector research parters, we offer a growing number of team-taught courses, in subjects ranging from national security law and policy, to cybersecurity, emergency management, and management of the smart grid. 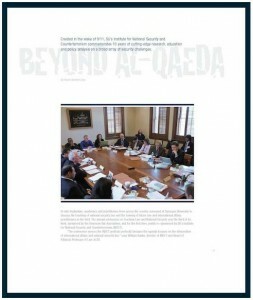 2007-2008: click here to download PDF. 2006-2007: click here to download PDF. 2005-2006: click here to download PDF.